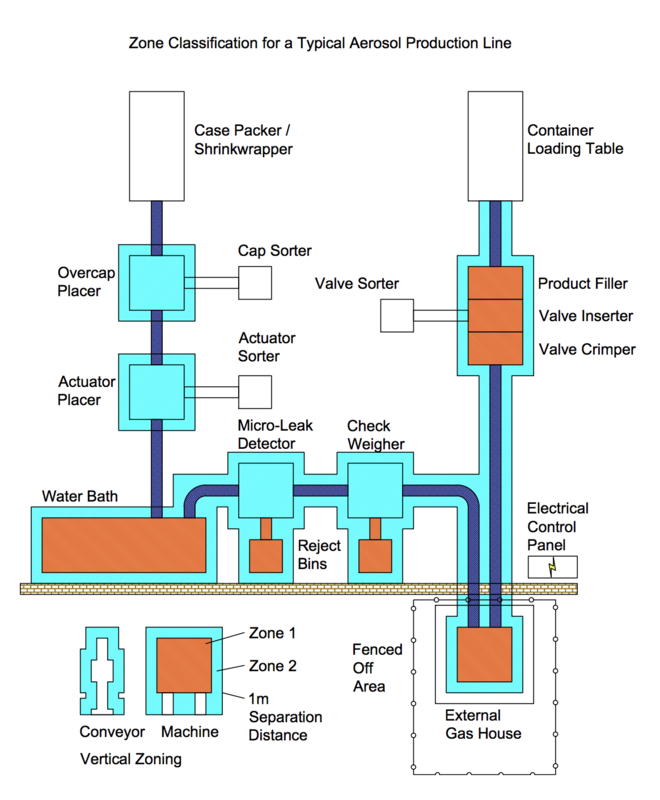 Read our Atex technical file Information, for a guide on Atex zoning for aerosol machines. All machines meet the requirements for Atex aerosol machines. A place in which an explosive atmosphere consisting of a mixture with air of dangerous substances in the form of gas, vapour or mist is present continuously or for long periods or frequently. -Within all flammable propellant vessels and pipework. A place in which an explosive atmosphere consisting of a mixture with air of dangerous substances in the form of gas, vapour or mist is likely to occur in normal operation occasionally. -Within the primary enclosure of aerosol gassing machines, the product filling machines (depending on the product used e.g. alcohol), the propellant and product service connections, the water bath and any bins containing aerosols rejected from the production line. A place in which an explosive atmosphere consisting of a mixture with air of dangerous substances in the form of gas, vapour or mist is not likely to occur in normal operation, but if it does occur, will persist for a short period only. -Within tank farms, the product processing area, all machine enclosures on the aerosol filling line not classed as Zone 1 and all transport routes of the aerosol up to the water bath or leak tester. Possible faulty or abnormal conditions include puncturing of containers by starwheels, so downstream equipment such as the actuator placing and capping machines should be considered for classification as Zone 2. Also consideration should be given to specifying a separation distance as Zone 2 for 1m in all directions from any Zone 0 or Zone 1 area. This 1m rule is not definitive and the risk assessment should identify local conditions that might affect the diffusion of any gas, vapour or haze due to spillage or leakage. The design and manufacture of R&R Machines meet the requirements of the Atex technical file. Since the Atex aerosol machines operate in a potentially explosive atmosphere, they also comply with the BAMA requirements to Zone II 2G (which is classified as Zone 1).